Now you can download and install the latest B198 Nougat Update on Huawei Mate 9. Huawei Mate 9 B198 Nougat Update is the latest security patch. Android 8.0 Oreo Update for Mate 9 is already available but that was a beta version if you want a stable version then you can download Huawei Mate 9 B198 Nougat Update from below. Huawei Mate 9 is the latest flagship device from Huawei. Mate 9 features a 5.9 inches display with a resolution of 1080 x 1920 and a pixel density of 373ppi. The phone powered by Octa core Hisilicon Kirin 960 processor with 4GB of RAM and 64GB internal storage. 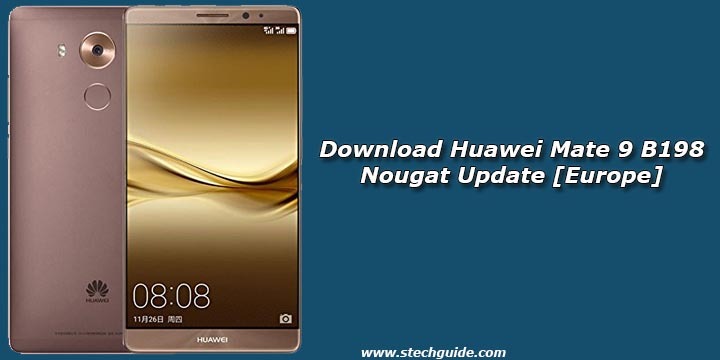 You can Download Huawei Mate 9 B198 Nougat Firmware from below which has a build number MHA-L29C432B198. This Firmware file is only for Huawei Mate 9 MHA-L29. Don’t try this on any other device. 1) Requirements for this method. You need to unlock the bootloader of Huawei Mate 9 first, Skip it if you already had it unlocked. Download the above three files and rename the “update_data_full_public.zip” file to update_data_public.zip and “update_full_hw_usa.zip” to update_all_hw.zip. 2) First download the HWOTA_MHA.zip from above and extract it on your PC or your device SD Card. 3) Now download all three update, data, and public files (make sure you rename the files as mentioned above) and copy them either in the external SDCard inside an HWOTA folder or in the PC in the C:..HWOTAupdate folder. 4) Run the update.bat file as an administrator, It will ask you if you copied the files. Press any key to continue. 5) Now connect your device and Reboot into Bootloader mode using “Volume Down + Power” or just use “adb reboot bootloader” then press any key. 6) The above step will install TWRP in your device. 7) Now Disconnect USB Cable and turn off your device and use “Volume Up + Power” to enter TWRP. 8) Once you’re in TWRP mode, plug in the USB cable again and press the Enter key on your computer. 9) If your files are saved in the HWOTA folder on the SD card, type 1 and press ENTER and if files are saved in the HWOTA/Update folder on your PC, type 2 and press ENTER. 10) It’ll ask you the update type, again type 1 and press the Enter button twice. 1) First, you need to unlock the bootloader of Huawei Mate 9 and download and install a custom recovery. If you already had an unlocked bootloader and custom recovery installed on your device then skip this step. 2) Download Huawei Mate 9 B198 Nougat files from above and save it on your device. 3) Now Boot your device into TWRP Recovery mode. 5) In TWRP first flash the update.zip file and once done without rebooting your device moves to the next step. 6) Now flash the second and third firmware file. 7) Wait until the process finishes. 8) Done! Reboot your device and enjoy.